Our guide to the best events and festivals in Keswick. Ring in the New Year in Keswick. Market Square is alive on New Years Eve and in Keswick it is tradition for everyone to gather just outside the Moot Hall. Celebrate the New Year with locals and visitors alike as they assemble just before midnight in the Market Square. There’s no better way to welcome in the New Year than a New Years Day walk in our breathtaking landscape and a traditional pub lunch with a roaring fire. A 10-day programme of literary talks, lectures, discussions, workshops, book launches and special exhibitions at the Theatre by the Lake. An incredible route around the shores of Buttermere & Crummock Water. It’s ideal route for all abilities, you do not have to be super fast or an elite athlete to enter, perfect if you are new to trail running and looking for a new challenge. Said to be one of the most scenic half marathons in the country. The challenging course takes you around Derwentwater with an extra loop into the Newlands valley. This four day festival brings together many of the world’s best exponents of New Orleans, Swing, Hot Club, Classic, Traditional, Mainstream Jazz and Blues. 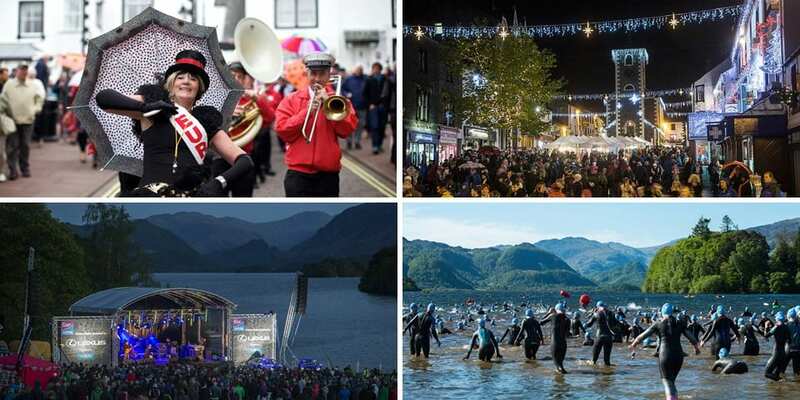 The Keswick Mountain Festival attracts thousands of visitors to Keswick for a wide range of sporting and outdoor events, live music and legendary speakers. With more than 250 activities to choose from, there’s plenty of choice no matter what your age or ability. Over 250 barrels of beer, lager and cider are available to sample, with live bands providing the entertainment. The Keswick Beer Festival is always a sell-out, attracting nearly 6000 beer enthusiasts over two days, so be sure to book early. A classic 2.4 mile swim, 112 mile cycle and full marathon run. The Lakesman Triathlon is designed to appeal to both the experienced or novice endurance athlete. Ten peaks in the Lake District to be completed in ten hours – or a five peaks in five hours challenge in aid of MS Society UK. Founded to provide a showcase and a celebration of the best of wool and wool crafts. The event is all about creativity and design with beautiful quality, amazing colours and skilled craftsmanship. Derwentwater is the opening event of a series of three open water Epic Lakes Swims. There are 3 distances to choose from which provides novices, intermediates and elite swimmers with a challenge to match. A three-week Convention, which attracts some 15,000 Christians from the UK and around the world. An action-packed day for all the family. The annual show first began in 1849 and the animal classes include cattle, sheep, goats, horses, poultry and ostriches. Bassenthwaite’s annual regatta week offers wonderful sailing in a great family environment and in a setting of unrivalled natural beauty and ranks amongst the most popular open events in the North of England. A traditional agricultural country show with animal exhibits, industrial marquee, trade stands, arts & crafts marquee, Cumberland & Westmorland wrestling, poultry classes, working sheep dogs, terriers, foxhounds and children’s pets. Around 40,000 people cvisit Taste Cumbria Cockermouth each year – a sure sign that this is a fantastic event, with foodies across the county looking forward to the county’s biggest culinary treat. The Cycling Weekly / mbr Lakeland Monster Miles starts and finishes at Fitz Park, Keswick. Both picturesque and challenging, offering something for everyone. A spectacular 10 mile road race run clockwise round Derwentwater. Over 100 vintage sports cards from the 1920’s and 30’s coverage on Honister Slate Mine in a throwback to the golden age of motoring. A series of pop-up (and annual) festive events held each day between 1st-24th December and the lighting of an illuminated shop window. Join Keswick Launch Company for a festive cruise around Derwentwater with Father Christmas during weekends in December. A day of family fun! Keswick’s Victorian Fayre has lots of decorated food, gifts and charity stalls, and a host of live music, street entertainment, and a Lantern Parade. A small fun fair and a visit from Father Christmas guarantee it will be a hit with the children.